Simple to use, high-quality, and affordable. Not three virtues you often see together but the Tascam DR-05 V2 encompasses them all in an extremely portable, high-resolution recording device. Gone are the days of high-quality stereo recording meaning a massive, expensive recorder. The Tascam DR-05 is a lightweight and small field recorder that records 96kHz/24-bit high-resolution audio in your choice of MP3 or WAV format to microSD or microSDHC via a pair of sensitive condenser microphones that pick up granular detailing but can also handle up to 125dB SPL. With Peak Reduction and Quick Menu features built-in, professional recording is more accessible than ever. In addition to the built-in microphones there is also the option to use your own, or record from another line-level source, with the 1/8” stereo input that offers plug-in power to mics that need it. The Tascam DR-05 Portable Handheld Recorder has been designed to consistently offer clean, crisp sound, with its digital and analog circuit boards being built separately and low-impedance design increasing noise performance and decreasing hiss. This is alongside the A/D and D/A converter being sent a separate power supply for increased audio performance. With all this technology equipped, the Tascam DR-05 really delivers, with over 92dB signal to noise ratio, under 0.05% total harmonic distortion and 20Hz to 40kHz response (-1/+3dB) at 96kHz/24-bit resolution. The Tascam DR-05 Portable Digital Recorder has been designed in a way that makes it easy for anyone to be able to pick it and record straight away, without wading through a thick instruction book. The ability to record, adjust levels, delete bad takes and add markers are just a thumb press away, though those with more experience can delve deeper to utilise the more advanced features on offer here, such as limiting, low cut filtering, using the built-in chromatic tuner and more. A new feature that makes the Tascam DR-05 so easy to use is Peak Reduction. 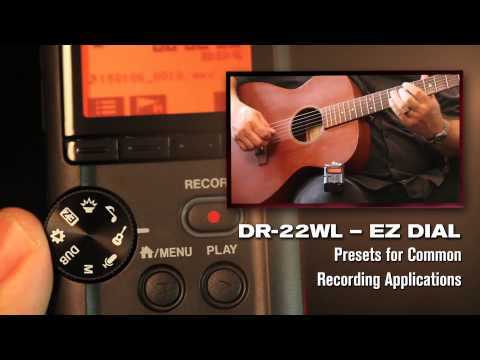 This addition intelligently sets your recording level to avoid accidental distortion and adjusts your levels to give the best possible recording. Alongside all the other perks, the Tascam DR-05 Portable Recorder also harnesses classic Tascam features, such as Variable Speed Audition, which is perfect for learning new music as it allows you to loop and slow down music easily (without changing the pitch), and A Level Align, which smoothes out volume peaks during playback. A built-in speaker is also provided for quick reviewing of recordings, and the unit will last for approximately 17.5 hours on just two AA batteries, even when recording at high-quality.